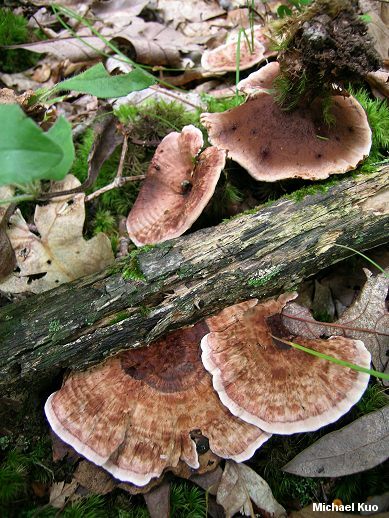 Found under oaks and other hardwoods in eastern North America, this variable Hydnellum features a brownish pink to pinkish brown cap that sometimes develops radially arranged ridges, lumps, bumps, or rather amazing outgrowths. Additionally, the cap is usually at least somewhat "zonate," meaning that it displays concentric zones of color and/or texture. 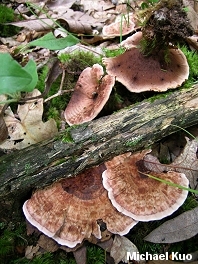 Hydnellum scrobiculatum is a very similar species. Officially, it is never zonate, develops a bumpy cap more frequently, and has spores whose nodules are rounded or flattened, and less prominent. It is usually recorded as growing under conifers. In the real world, however, collections are frequently made that seem to grab whatever features they want from the official concrescens and scrobiculatum lists, resisting the limits set by mycologists. 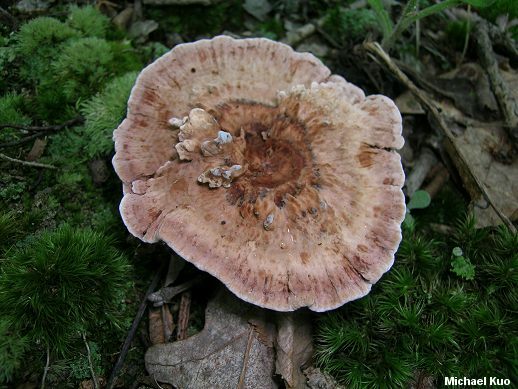 The Latin name of Hydnellum concrescens refers to its tendency to develop "concrescent" fruiting bodies that have grown together and become fused. However, this tendency is displayed to varying degrees by many species of Hydnellum. Hydnellum scrobiculatum var. zonatum, Hydnellum zonatum, Hydnellum fasciatum, Hydnellum queletii, and Hydnellum vespertilio are synonyms. Hydnellum concrescens is a classical, European species; our North American version may not be the same thing. 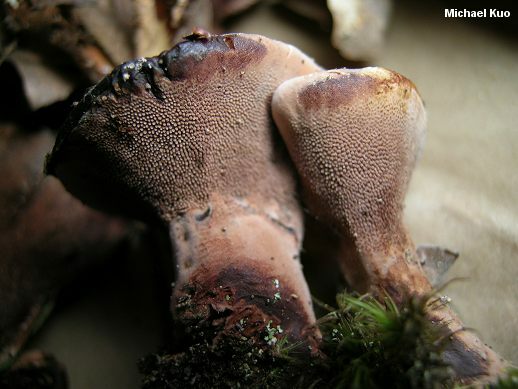 A western version of this species is recorded (Hall & Stuntz, 1972) under conifers, along with a diminutive form (forma parvum, sometimes called Hydnellum parvum); these mushrooms may or may not (probably the latter) represent the species described here. Ecology: Mycorrhizal with hardwoods (especially oaks); growing alone or gregariously; summer and fall; widely distributed in eastern North America (but see the note below about western collections). 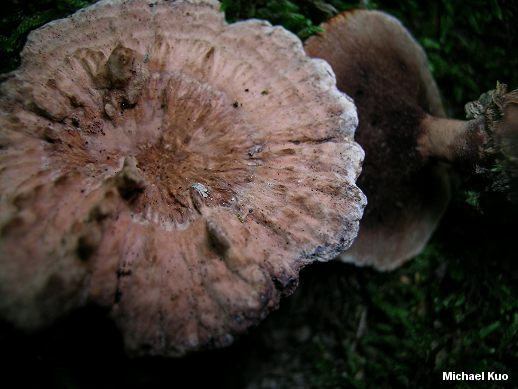 Cap: Often fused with other caps; 2-10 cm wide; planoconvex, becoming flat or shallowly depressed; finely velvety or nearly bald; not infrequently developing pits, radially arranged ridges, or elaborate outgrowths; brownish pink to pinkish brown, sometimes fading to nearly whitish; with concentric zones of texture and/or color; the fresh margin bruising dark brown to black. Undersurface: Running down the stem; covered with crowded spines that are 1-3 mm long; whitish at first, becoming brownish to brown. Stem: 2-4 cm long; .5-2 cm thick at apex; often swollen and velvety or spongy, especially towards the base. Flesh: Pinkish to brownish, often with zones of these shades; tough but pliant. Odor and Taste: Odor not distinctive, or mealy; taste mild or mealy. Chemical Reactions: KOH on flesh blue-green to olive, then slowly gray to black--or promptly black. 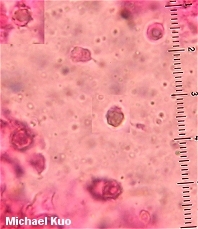 Microscopic Features: Spores 4-7 µ; subglobose to irregular; prominently nodulose. Clamp connections absent. REFERENCES: (Persson, 1796) Banker, 1906. (Saccardo, 1888; Coker & Beers, 1951; Hall & Stuntz, 1972; Smith, Smith & Weber, 1981; Baird, 1986; Baird & Kahn, 1986; Phillips, 1991/2005; Barron, 1999; Miller & Miller, 2006.) Herb. Kuo 08050404, 07270704.